This week's Aquascape Analysis is ADA Tank 35 from the ADA Thailand website. This is a beautiful tank with a mossy foreground, tall busy background plants, and a great sense of depth. 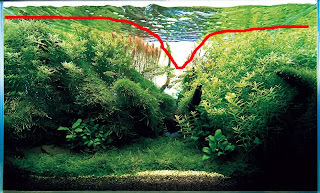 If we take a look at the profile, we can see fairly easily that this is a "V" shaped aquascape. In fact, the plants on either side nearly reach the surface of the aquarium. The deep drop in the middle combined with the gradually shorter plants towards the middle create a sense of perspective as well, creating depth. The focal point of this aquarium is the only red plant in the aquascape, off-center in the background. Since it is the only red plant in the aquascape, it draws the viewer's gaze immediately. A red plant among green is often the easiest way to create a focal point. There are several secondary focal points as well, with the bright green plants on the right and left dominating. However, the small anubias in the midground also serve as a secondary focal point due to the contrast in leaf shape, size, and color against the moss and a dark background. As for the flow of this aquascape, it tends to originate from the focal point (as in most Amano style aquascapes). It then moves towards the left side of the tank. This is the dominant side of the tank, despite the brightness of the right. It's the depth and contrast of textures on the left side that draws the viewer's gaze. The viewer's gaze then either returns to the focal point or moves to the right side, directed by the moss covered driftwood. A large part of the right side is also dark, adding to the submissive role this side plays in the overall aquascape. 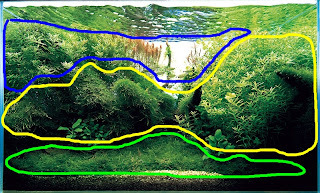 As for the foreground (green), midground (yellow), and background (blue), the foreground is clearly almost entirely moss. 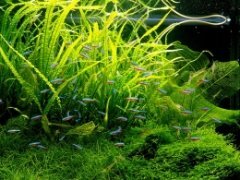 This aquascape makes use of moss as a ground cover and it helps at a messy, wild feeling to the aquarium (without actually being too messy or wild, almost a controlled chaos). The midground makes up the bulk of the right side and most of the moss covered driftwood. I included the right side in the midground because I feel that due to a lack of depth, the right side almost feels like it is right up to the glass (and it is to some extent, note the large dark space in the bottom right). The background makes up the remaining part of the tank, including the focal point and some of the plants from the right hand side that are further towards the back of the tank. The major lesson that can be learned from this aquascape is that the use of depth can affect the flow and composition of the aquascape greatly. By using depth on the right hand side, the aquascape draws the viewer's gaze to this side. The right side is much closer to the viewer, and is thus not as comfortable to look at compared to the left side. 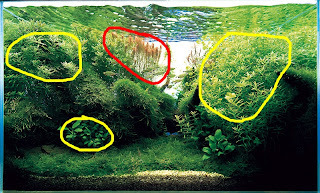 Perspective and depth can also be forced in smaller tanks by placing plants in a gradually descending row. This effect has to be fine tuned, but if used correctly, can add depth to even the smallest tanks. I found your analisys on aquascapes very useful. There are no such thing all over the web. Please go on in this way.